Public-private partnerships (PPPs) are used for numerous collaborations between the government and the private sector, but the ways in which they have developed to support economic recovery and resiliency differ from traditional PPPs — and even from more recent, and complex PPPs. These PPPs play an increasingly important role in our national approach to emergency management and disaster recovery. 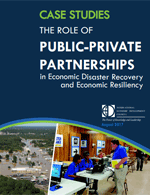 In this briefing, the International Economic Development Council has compiled five case studies to highlight best practices and strategies for creating PPPs for disaster recovery. This research project was accomplished through the U.S. Economic Development Administration (EDA)’s Economic Adjustment Assistance Project No. 08-06-05058. The statements, findings, conclusions, recommendations, and other data in this report are solely those of IEDC and do not necessarily reflect the views of the U.S. Economic Development Administration. This report is part of a larger compendium of research and technical assistance produced by IEDC and funded by the aforementioned U.S. Economic Development Administration (EDA) grant, which focuses on long-term economic resilience and recovery for disaster-impacted communities in Texas, Louisiana, Arkansas, Oklahoma, and New Mexico.